I left my wok in Argentina. And I feel nearly as strong about that as Tony Bennett leaving his heart in San Francisco. Fine, maybe not that much, but I will miss it. 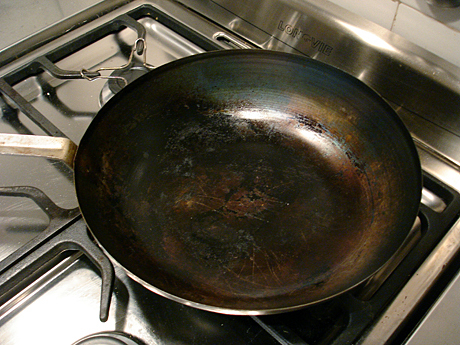 When my dad came to visit me in Buenos Aires, he was surprised to learn I had bought the wok only two months before. “It looks really well seasoned already,” he said. Yes, I had put the wok to a lot of use. It was perfect for cooking for one. It cooks things quickly, it’s easy to clean, and it’s shaped so you can make your food do fun flips. For the first month I had it, I didn’t use the oven at all, making everything in the wok instead. Asian-style stir-frys and fried rice, of course, but also my version of Chipotle’s burrito bowl and other one-dish creations like a meal of sausage, potatoes and zapallitos redondos (round squash). Plus, a wok gets really hot quickly, and since I didn’t have a microwave, I used it to reheat pasta or other leftovers. Part of me wished I could have fit the wok in my luggage, but I guess I’ll have to get a new one and start over. 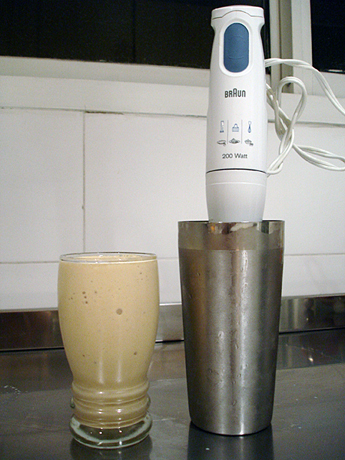 People laughed when they found out I packed an immersion blender for my stay in Buenos Aires. Well, I'm happy to report that it has been getting plenty of use. Pureeing butternut squash and whipping cardamom cream, but most often to make banana milkshakes. Now, I wouldn't normally consider a banana and half a glass of milk to be dessert. In fact, I would have scoffed at the idea two months ago. But, folks, it's just like ice cream! When you blend a frozen banana with milk, it comes out thick and creamy like any great shake. Many others have probably learned this before me, but in case you haven't tried it, get some bananas in the freezer, stat! Sometimes I put a spoonful of dulce de leche in it, and it's still the healthiest dessert I love to eat. Ahh, to live in Maine. The quiet forest, the dewey mist-filled mornings. A cabin, tucked behind trees untouched in years. I have no idea what I’m talking about, the last time I was in Maine, I was 3. But, my Zizi Bev and Uncle Mac (Zizi is the unisex Italian nickname for Great Aunt/Uncle, or so I’ve been led to believe by my family) have a cabin up there, in addition to normally living in the constantly overcast Syracuse, NY. My mom is jonesin’ to move up there eventually, maybe to retire. I will say, those Mainesians… Mainites… the people up in Maine, make a mean Porter and if I could eat lobster a quarter as much as I think I can, I’m with ya on that one Ma. Being in an Italian family means everyone knows all the rumors and talk about the family at pretty much any given time. With almost certainty, Zizi Marge knows who I’m dating or what I want to do with my life, despite not talking to her personally in probably 4 years (I know, I’m a horrible kid). The beauty of grandmothers and Zizis. Anyway, so Zizi Bev and Uncle Mac heard I was enjoying cooking lately, and quite thoughtfully sent me the greatest salt and pepper mill set I’ve ever held. My mom has a pair as well, and I’ve always marveled at their precision and durability.